Regular Size: 3"x4" Dome. Wood Base/Glass Dome. Made in USA. This Dome contains a brass hook extending from the platform which can hold your pocket watch. Extra Large Size: 4"x7" Dome. Wood Base/Glass Dome. Made in USA. 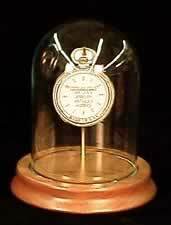 This Dome contains a brass hook extending from the platform which can hold your pocket watch. 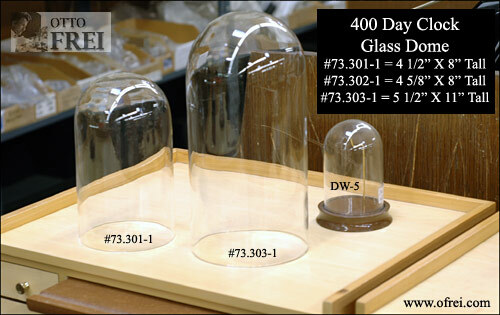 400 Day Glass Clock Dome 4 1/2" x 8"
400 Day Glass Clock Dome 5 1/2" x 11"